It’s a question that has been asked since time began, well at lest since we’ve had table saw’s and band saw’s. It doesn’t matter who you ask, everyone will have an opinion as to which one you should have in your tool arsenal. Both these machines are incredibly versatile and a lot of stuff that can be done on one can also be done on the other. If your primary task is ripping stock, then in my opinion the table saw wins this round hands down for speed and quality. nothing can beat the trusty table saw for this. It does the job quickly and cleanly. you could argue it was what the table saw was designed to do. Depending on the type of woodworking that you do, you may find that the finish from the table saw is good enough for you, and anything that makes us more efficient in the workshop is fine by me. Using a band saw for the same task will leave saw marks on your cut edges which will most probably need cleaning up with a planer or hand plane afterwards. Its also worth noting that if you are going to rip on band saw and clean up afterwards, you’re going to need to cut your piece oversize as you will be reducing the size when you clean it up on the planer. It is also possible for a band saw blade to drift while you are ripping pulling your piece of timber away from the fence. From a safety point of view, then the band saw wins this one. All workshop machinery can be dangerous, so its important to do everything you can to minimise these risks. But unfortunately the table saw has a worse track record when it comes to injuries. You’re not going to find a band saw kicking back on you, and the constant downward cut of the blade means that if the piece does warp and catch, its not going to fly back at you.Table saw’s suffer from kickback, this is where your piece of timber timber can catch the back of the blade as it passes over the table, throwing it back at you at a great speed. The risk of this happening increases the longer the piece of timber you are ripping is. This is why it i so important to make sure that your riving knife is set up correctly as this will greatly reduce the risk of kickback. Crosscutting on a table saw is great solution. using a miter gauge or a cross cut sledge is a good quick safe way of getting the job done. You still have to make sure that you use a riving knife and blade guard to help keep your fingers safe. You can use the same method on the band saw, but you are still left with the problem of having to clean up the rough sawn edge. Table saw blades can be easily angled to give a beveled cut. The same can be done on a band saw but instead of angling the blade, the table itself is angled. Now this is the task that the table saw wins hands down. you can cut a dado on a table saw, by removing the knife and fitting a dado cutter. Unfortunately to use a dado cutter, you will need to remove both the riving knife and blade guard, decreasing the safety of the tool and increasing the chance of kickback. Its also worth being aware that a dado cutter, due to its increased weight and size will stop slower. The band saw hasn’t a chance to compete in this round, but all is not lost. A decent router may be a good substitute for this task. This round without a shadow of a doubt goes to the band saw. If your woodworking requires you to do intricate shapes and curves, then the table saw is going to be of no use to you here. Fitting a narrower blade will allow you to carry out all sorts of intricate work. This is a tough one, tenons and cheeks can both easily be cut on a table saw and band saw. Again a band saw cut will leave a rough surface, but this doesn’t matter here. Well maybe the shoulders will need a little cleaning up, but by simple adjustments of the fence and using miter gauge you can cut yourself a perfectly good tenon. The table saw is capable of giving you an equally impressive cut. Using a dado set with a miter gauge will do a good job. You can also use a tennoning jig with the table saw to cut the shoulders and cheeks of the tenon. As briefly mentioned, the table saw is seen to be a more dangerous than the band saw, and it would be hard to disagree. The band saw has always been seen as the safer choice, due to the way the blade cuts in a downward motion, pulling the piece of timber into the table. You’re also not going to experience kickback on a band saw, which is the biggest risk when using a table saw. But thats not to say that the band saw is 100% safe. At the end of the day it is a power tool designed for cutting wood and you should carry out all your normal safety procedures and practices when using one. 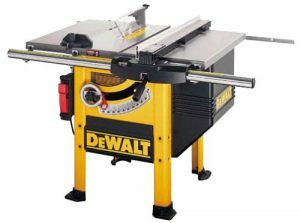 And OK, the table saw may be seen as the more dangerous as the two, but with proper care, protection and awareness, there is no reason that the table saw can’t be a safe tool to use. Don’t cut corners! take the time to set the machine up up properly for the cut. If you have any questions or opinions on the above or if there is anything I have missed on this or any other articles on this site then please get in touch using the contact form. I’d love to hear from you.